An international NGO trains rodents to find buried bombs and a deadly respiratory disease. Meanwhile, I’ve taught my dog how to carry three tennis balls in his mouth at once. More than 59 countries—a third of the world—are contaminated with ground explosives leftover from past wars. In 2012 alone, 1,066 people were killed by such explosives, and 2,552 were injured. Enter Apopo, a nonprofit whose motto is: “We train rats to save lives.” So far, their rats have found nearly 60,000 landmines Africa and Asia, freeing up nearly 25 million square meters for safe habitation. 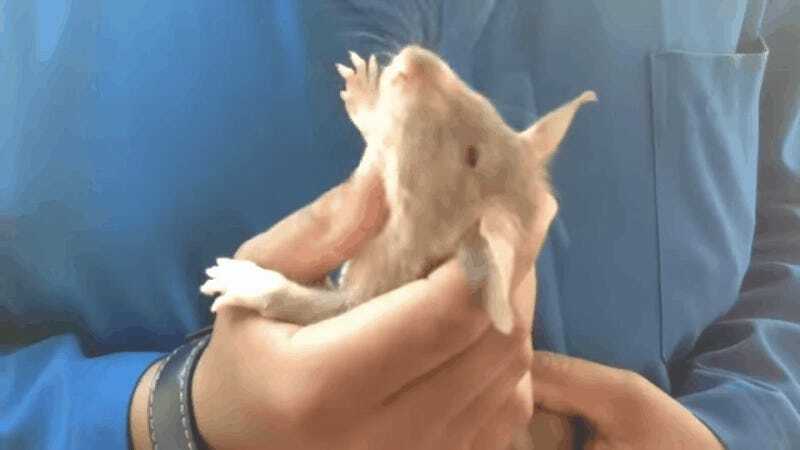 Apopo’s preferred critter is the African Giant Pouched Rat, who can live up to 8 whopping years, has a calm, trainable demeanor, and can easily carry out repetitive tasks it’s taught. You may be thinking, why not dogs? Well, these rats only weigh two pounds, which isn’t enough to set off a landmine, so they can detect one easily without danger. Rats also don’t bond with their trainers, so they can be easily transferred to a different post. They’re also way cheaper to train and raise than dogs. Finally, these rats are African natives, and can adapt to the harsh environment. The rats are trained using reward conditioning. They’re given some banana the same time they hear a clicking sound, so they associate clicks with food. Later, in an experiment, the rat is put before three holes, each emitting a different scent. When the rat sniffs the “target” scent (TNT), it hears a click and is rewarded with food. The experiment then moves into a sandbox to mimic a real world situation, finding deactivated landmines with increasing depth in the sand. At the end of their training, the rats will have been tested with criteria that match the International Mine Action Standards. Apopo was one of 14 innovators picked by the United Nations to present at last month’s Solutions Summit, which called for member states to find people using emerging technology and science to address the 17 Sustainable Development Goals. It doesn’t stop there, either. These skilled four-legged lifesavers have also been trained to sniff out tuberculosis in Tanzania. The rat can screen a hundred samples in less than 20 minutes, a task Apopo says would take a human lab tech over two days. It all starts as soon as the rat opens its eyes at four weeks, to better acclimate it to humans. Using the same click-and-banana training method in a controlled lab environment, the rat is trained to sniff out samples that test positive for TB. Later, in a real situation, the rat can detect TB in samples from real patients. It takes around nine months for the training. Apopo says nearly 8,700 cases of TB have been detected using the rat method, and almost 35,000 potential TB infections were halted. 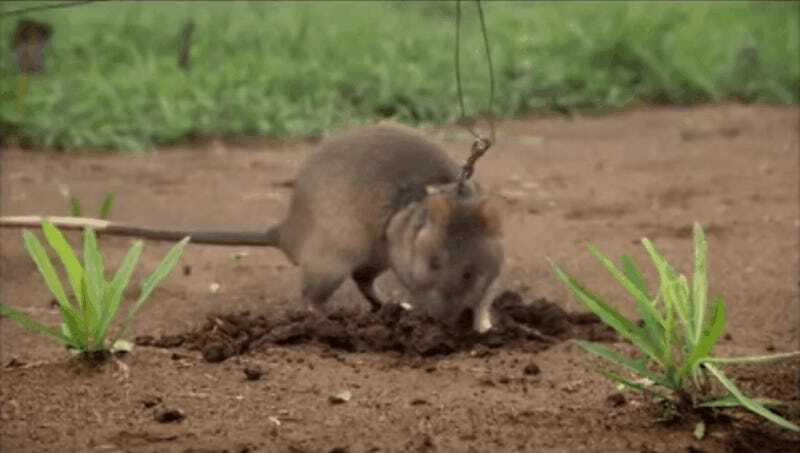 Apopo was started by a dude who likes rats, but also wanted to change the world: Back in 1995, Belgian student Bart Weetjens was trying to figure out a way to combat the global landmine problem. After reading a publication that reported gerbils can be used as scent finders, he realized that a rat could be a cheap, smart, widely available landmine detector. Two decades later, the super rats have helped seven nations get rid of buried threats that are otherwise really hard to find.